There is a new book called “The Wizenard Series: Training Camp.” The creator of this book is NBA Hall of Fame player Kobe Bryant, and the author is Wesley King. Kobe Bryant has gone from a basketball legend to an amazing author. The new book is about the team West Bottom Badgers, the lowest-ranked team in the league. The story is broken down into five books each focusing on the story of one character: Rain, Twig, Cash, Peno and Lab. All of the young kids in this team come from the poorest neighborhood. No one has faith in the kids to succeed. Then a new coach joins the team, Rolabi Wizenard. After the coach joins the team the kids start to get really strange unique visions that can challenge them. It shows them about life lessons he tries to teach them in different ways. Each player has his own struggles whether it is fitting in or fighting to be the best on the team. One of our favorite parts of the book is when Peno starts rapping. In the beginning of the book Peno said, “The Badgers are back, and yes our gym is wack, but the boys are better, down to the letter, we coming for the win, uppercut to the chin, Dren best watch fur the Badgers because we are well . . ." After that Peno didn't finish that rapped part because nothing rhymes with Badgers. After having read the book, we got to interview Kobe. We met him at Barnes and Noble Book Store in Union Square, Manhattan. We were nervous to interview a great legend of basketball. We were also very excited to meet him. When we entered the room, we had the biggest smiles we could have ever had. He shook our hands, made us feel so welcome, and we got to sit down with him and ask our questions. One of the questions we really wanted to know was what his favorite part of the book. Kobe told us it was when Big John would bragabout his mom's biscuits, but Rain said they wouldn't know because he eats all of them! We were excited to hear his second favorite sport was soccer, because this is something we all play at recess. His favorite soccer team is Barcelona. He said to us that he likes that team because they use team strategy and move the ball well around the field. 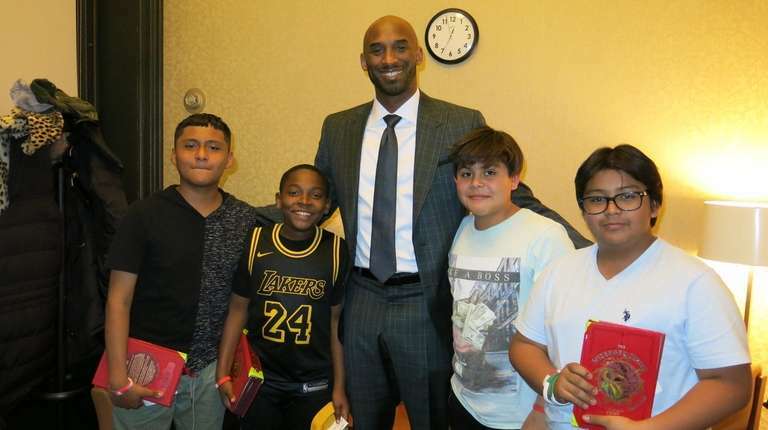 Kobe added that he even uses their strategy to teach his own kids to play basketball. With the game on the line, one player always wants the ball to make the big play. We asked Kobe if he was that type of player. He gave us a big smile and told us that he always wanted the ball. He said that is why he played the game. It is no wonder why he identifies with the character Rain in his book. We also wanted to know if his jersey number has any meaning because there were two different numbers — 8 and 24 — that he had during his career. Originally, he said, his high school number was 33, but he couldn’t have that number. He couldn’t have jersey number 33 because it was retired by Kareem Abdul Jabbar. We thought that the number is very important because it was his All American number, sort of, it was 143 and if you add that it is number 8. The number 24 means you need to work hard for 24 hours. We had asked who inspired him he said some of the people were Bill Russell and Michael Jordan he even modeled the coach after Bill Russell since he had a high basketball IQ. We asked him when he was younger if being an author was something he wanted to pursue and he said no. He couldn't imagine himself being an author. Kobe didn't think he was going to be an author but he told stories to his daughters, and that is one of the reasons he wrote his own book. We asked him if there were times now he wanted to lace up and play he had said no, but that 10 years ago that was something he never thought he would say either. He had said he would like to play one-on one-with Michael Jordan. That is a match up we all would love to see! Finally, we asked him about his Olympic medals. Very few people have NBA championships rings and Olympic medals. We wanted to know what was more important: winning a gold medal or winning a championship. He told us the Olympic medal because he was representing his country and that meant more than representing any one city or team. Our final thoughts on Kobe. He was such a great guy. He was also a very funny man. We also thought Kobe was an interesting and he was well educated, because he spoke so well. Kobe was very tall, and we felt super short next to him. When Kobe shook our hands, we told everyone I didn’t want to wash it. We walked through the city with our hands (that he shook) up in the air saying we met Kobe. It was an amazing experience.